I have used Admiral Carpets now for years as they always deliver a professional service and the carpet fitters are always polite, professional and never leave a mess and they had a 5m long carpet to go to our loft and they were carful not to scratch our walls that were just painted. The finish of the loft carpet is like a hotel as we requested. I fully recommend Admiral for there carpets and service. 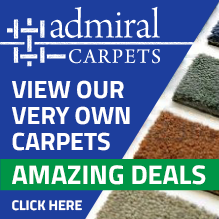 At Admiral Carpets we have lots of samples to choose your styles from. It is very important to make the right decision with regards to your carpet choice as it will affect the whole atmosphere of the room. The style and colour will show your visitors what type of person you are, if it is a deep pile carpet they will know you like luxury and to be relaxed and comfortable when at home. If you choose a carpet with a regular design they will know you “like things to be in order” and fit in correctly with the other decorations. A neutral colour means that you have other things going on in the room and you do not want the carpet to be the main feature. We will try and guide you to the carpet that is suitable for you with our 25 years plus of knowledge that we have available to us. We have business links with 40 – 50 companies so most carpets are accessible to us. We cover all areas in London, Surrey, Kent and in and outside the M25. If you are not in these areas please do not hesitate to contact us as we are willing to go further a field to deliver you the best service.